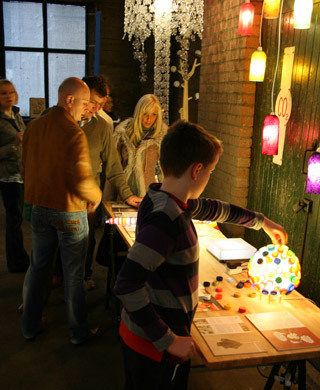 Lighten Up showcases 64 of the UK’s most innovative sustainable domestic lighting solutions. Looking beyond the bulb, Lighten Up explores the power of design to pioneer sustainable lighting – from new technologies and materials to aesthetics and interaction. Shedding light on the stories behind the products, Lighten Up offers insight and inspiration for the next generation of lighting. 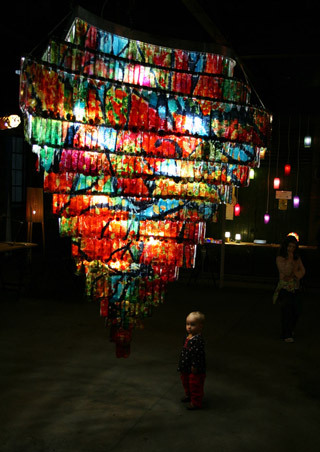 Lighten Up received a great response at its launch, when it appeared as a feature at 100% Design, Earls Court, in September 2008. 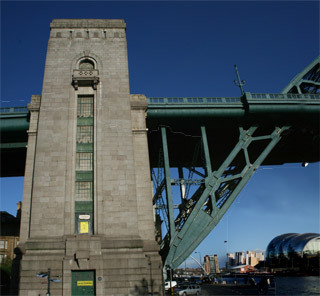 Second stop on the Lighten Up tour was Newcastle’s Design Event 08 festival, where the exhibition appeared in the fabulously atmospheric North Tower of the Tyne Bridge, on Newcastle's Quayside, from 18-26 October 2008. Lighten Up will tour throughout the UK into 2009. We welcome venue suggestions – please get in touch. Focus on efficiency: new uses and looks for energy-efficient lighting technology, renewable energy sources, monitoring energy use and motivating behaviour change. Material choices: sustainably produced natural resources, local production, reclaimed or recycled materials. User engagement: adaptability and responsiveness, user as maker, and designs that recall past times. Long-term thinking: products that last a lifetime, and design with future lifecycles in mind. Lighten Up follows in the footsteps of SIT UP: Sustainable Seating Stories, which investigated the journeys of sixteen sustainable seats from inspiration and development into production and use, demonstrating a broad range of design approaches all propelled by the belief that design can help create a better world. First exhibited at 100% Design 2007, it received the Hidden Art Award for Best Appearance During the London Design Festival, and toured to Singapore Design Festival 2007. [re]design is now seeking partners committed to sustainability and innovation, to help get these bright ideas seen at high-profile venues and events across the UK. As a venue or sponsor, you’ll play a key role in bringing Lighten Up to consumers, designers and trade audiences – and benefit from our track-record in delivering exciting design events with mass appeal and creative flair. Now more than ever, we believe design is key to making sustainable living aspirational and achievable. People are all too aware of environmental problems and are seeking functional, desirable solutions. Lighten Up proves that the quest for sustainability can inspire rather than limit creativity, and that there’s much more to sustainable lighting than changing a bulb. [re]design invites you to partner with us to highlight brighter futures. Lighten Up advances the message of sustainability one step further into the mindsets of the public and industry. Importantly, it doesn’t force the message or make us feel guilty for our consumption but, instead, suggests feasible and desirable alternatives that marry human nature’s creative instincts with a different approach and attitude to production. It is no longer about ‘newness’ of material, but ‘newness’ of thinking.”. 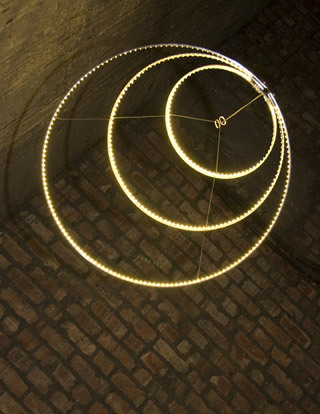 “Lighten Up is the most innovative and stylish lighting project I have seen. 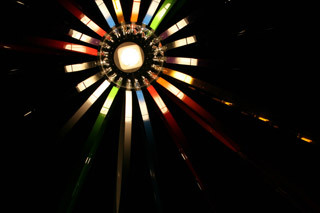 No other initiative is showcasing sustainable lighting in the UK as effectively. The calibre and diversity of its exhibits swiftly eliminates the misconception that energy saving lighting is ugly or uninspiring." “By approaching the defining issue of our time in a grounded, personal and truly engaging way, [re]design are thought-leaders in the sustainable design arena and an organisation I always enjoy working with and learning from." “A glorious, resourceful and forward-looking approach to design." 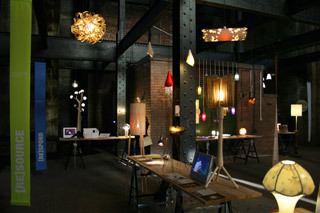 Images from top: North Tower of the Tyne Bridge; interior view of Lighten Up exhibition; visitors at Lighten Up with Cascade Lancashire by Michelle Brand, See-Through Light by Tea Un Kim, and CAPtivate by Lula Dot; Ateliero's giant EcoPETlite chandelier made from heat-pressed plastic bottles; Hula by Vamped; Circa light by Rawstudio.